Ok, in my opinion ball and tube style bottles have a little issue: they tend to drip if you don't get them just right or as the temperatures fluctuate. But...that's physics for you. 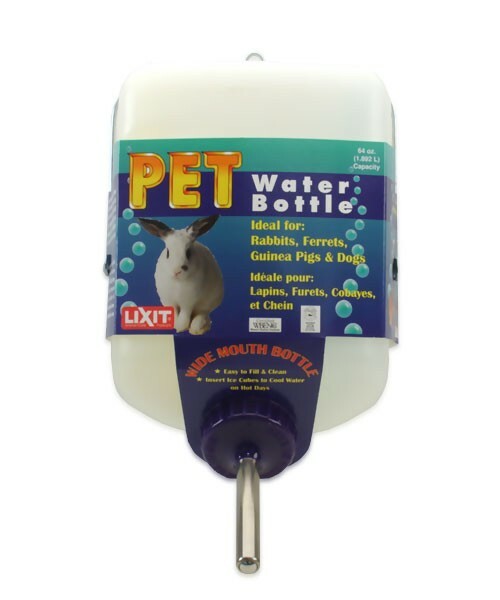 This bottle may be just what you need: it is huge and holds a ton of water, which is good for bunny. However, you should use a bowl underneath these as they will drip occasionally. Backing up your bunny's water bowl with a big water bottle like this just gives you the peace of mind that there will be water there when they need it. The point here is to make a great backup water supply, or to last a weekend. Ball style bottles WILL drip... that's not a bug, it's a feature as they say. So, we won't be taking them back just because they may drip occasionally, that is just the way ball and tube style spigots work...so get a cage mount bowl to put beneath it and satisfy your bun's drinking style however they like it!